My uncle has been fighting kidney disease for many years. However, I never REALLY knew how hard he had to fight every day just to lead a semi normal life. I never knew the courage it took for him to never complain, even make it to work on time or early every day. When I moved back to Texas, we got much closer and became a part of each other’s lives. This is when I got an inside look at his dialysis schedule and the toll it took on him. I remember the day when I had seen enough….we were having dinner at his house and after dinner he looked up and said “I’m sorry guys, I need to go to bed, I have no energy”. At that moment I knew that we had to take action. On the car ride home, I had a brief discussion with my new wife and we agreed that I needed to go get tested. We knew there is some risk involved, but she was willing and supportive. We immediately called my Uncle and Aunt and asked them to get us in touch with the transplant team. The risks were abundant and there were many “unknowns.” We prayed, asked God for guidance and ultimately found peace knowing we were doing the right thing. I was only 3 weeks into my new GM position at my new job but thankfully they understood and allowed me to have up to 3 weeks recovery time. Since that leave would have to be unpaid, the financial impact loomed for us, but that worked out as well. Having an amazing and supporting wife was paramount in this whole process, not just for the travel and logistics, but her bravery to be ok ( at least on the outside) helped me stay positive and keep a level head. My family were supportive, even though they were scared. My grandfather was the most scared because we had just reconnected and he didn’t want to lose that. At the same time he was proud of me! His being proud of me is something I had wanted for such a long time! He had also recently lost the love of his life, Jean Nelson, who is also my biggest inspiration for everything I ever do and every decision I make. I will be dedicating my first medal at the Transplant Games to her honor as she is and always be my strength and inspiration. 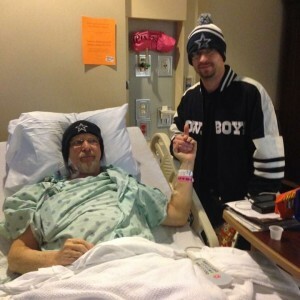 My Uncle’s transplant went great, the team at Methodist Hospital is just amazing. We were both home 3 days later to see the Dallas Cowboys win a playoff game. It was amazing to see my Uncle up and moving and to know that his new kidney was working just fine. Two weeks later, I was back to work, still slightly reserved but able to perform every function of my job. Five days after that I ran my first two-mile run!! 90-days post op, I was a part of a Kidney Run in my home town of Nacogdoches and placed first in my division and second overall. Since then, God has opened doors in my life that I never saw coming. I found a new job I hope to retire from and many more opportunities that I couldn’t possibly go into here. Sometimes, when we have faith and make the tough decision to do the right thing, amazing things happen. People are transformed and given new life and new hope. If YOU had the power to literally CHANGE someone’s life, would you be brave enough to get tested? Seeing my Uncle smile holding his first grandbaby makes me fulfilled, knowing that I had a small part in helping him be able to see her. He is doing great and living a full and happy life! We are super excited to attend the 2016 TGA this summer. We will bring back many stories of hope to share and help people who also want to donate. Go Team Texas Life Warriors!!! Awesome to hear such a great outcome. Well done Cliff.